Have you ever walked into a gym and witnessed numerous gym patrons (of all shapes, sizes, and genders) carrying around a gallon of water? Have you been a part of that crew yourself? Or have you looked on in speculation wondering “what’s the purpose of that?” Well, the truth is, drinking water (particularly the correct amount for your body size) has many benefits. Bodybuilders, cross-fitters, powerlifters, and other athletes know this and as a result, they will often carry around a gallon of water. Why? Because the water is more readily accessible and it’s easier to keep track of water consumption with a gallon, especially if your daily water consumption calls for a gallon of water or more per day. Let’s talk a little bit about the benefits of drinking water. The human body is made up of about 73% of water: you could say that the human body is like a vehicle but instead of running on gasoline, it runs largely in part on water. But, we often lose water throughout the day, even when we don’t realize it. Sweating (even small amounts) excretes water from the body and so does urination and even defecation. As the body rids itself of small and/or large amounts of water, it is our responsibility to replenish that supply. The standard recommendation for daily water consumption is eight, 8oz glass of water (64oz), but there isn’t much science behind this recommendation. A better way to determine how much water you should drink is taking your body weight and dividing by 2. That gives you the amount of water you should drink (in ounces) per day (e.g. a 140lb woman should drink at least 70oz) to reap the benefits of daily water consumption. So why should you drink more water? Exercise increases core body temperature, which then elicits sweat glands to excrete sweat (i.e. water) to cool the body down. While this cooling mechanism is beneficial in decreasing core body temperature, it also increases the risk of dehydration. Dehydration can lead to dizziness, fainting, weakness, fatigue, heart palpitations, and other cognitive disturbances. During physical activity, increased hydration is essential, particularly during intense exercise or in higher temperatures to avoid the symptoms of dehydration. Drinking water prior to exercise and during exercise may reduce oxidative stress during intense exercise as skeletal muscle is made up largely of water (~80%) and increase physical performance as a result of the skeletal muscle phenomenon. 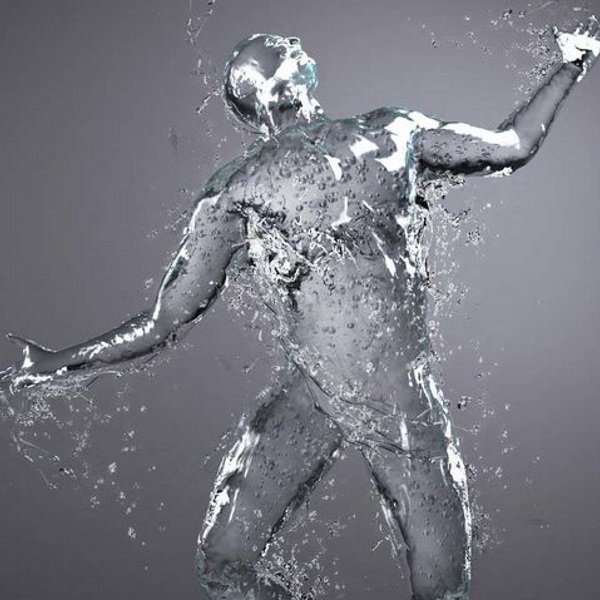 The brain is no exception to the amount of water that the human body is made of. It functions off of proper water consumption in addition to various other elements. Much like the muscular system, the brain requires water to function optimally. Dehydration may contribute to confusion and short-term memory loss. Studies show that even mild dehydration (1-3% of body weight) can impair brain function. In addition to diminished cognitive capacity as a result of dehydration, a lack of water consumption may impair mood and anxiety and increase the frequency of headaches and migraines. Drinking water can increase weight loss as it increases satiety and boosts metabolic rate. In two studies, this increase in metabolism was evident for up to 1.5 hours with a 24-30% metabolic rate increase after drinking only 17 oz of water. Increased water consumption also helps with decreasing hunger, which may lead to less food ingestion. Water consumption, particularly 30 minutes prior to eating, makes the stomach feel more full, decreasing the need to eat larger portions of food. Likewise, in a study, those who drank half a liter of water 30 minutes prior to exercise lost 44% more weight over a 12-week period than those who did not consume 17 oz of water prior to exercise. This phenomenon goes back to an earlier benefit mentioned, increased physical performance. Since the muscles are made up of 80% water, it makes sense that drinking water prior to exercise increases weight loss as hydration boosts the body’s ability to do more work. Low water consumption is a risk factor for constipation: water propels food waste through the stomach, large intestine, and colon. Much like skeletal muscle, these organs need water to operate properly. In the event of low water consumption, the organs that move along waste through the digestive system must pull water from that waste, causing constipation. If, however, a person is properly hydrated, there will be enough water present in the body for the organs that move the waste as well as the waste itself, decreasing the risk of constipation. The kidneys main function is to filter toxins in the body. Much like constipation relief, water controls the ease with which the system works. Water helps to filter toxins through urine excretion; therefore, if water is plentiful, the kidneys don’t have to work as hard to filter toxins and urine flows freely. In this case, urine will be free of color and odor because the kidneys have enough water to filter toxins and can release excess water through urine. If water is inadequate, urine will be dark and carry an odor as the kidneys have to hold onto the little water that the body does have to filter those toxins in from the body.